After a rainy Friday morning, the summer joined us again for the rest of the weekend. Even though the weather was pretty average to start with on Friday, at least there were waves. I was frothing because I did not have to work and the surf looked pretty good. When I went for a surf during the ‘late shift’ at 8.00 am, there were still lots of familiar faces around. An indication that it’s quite good out there. Good enough to be late for work anyway. I have to admit I was a tiny bit disappointed when I ended up having a shocker of a surf. Yes, there were many close-outs but enough guys had some great waves. You just had to pick the right ones. But I just had one of these days. The only waves I caught were pretty average and straight handers. I watched one guy having a cracking right in the South corner. I was next, but the right decided to be a left and the guy next to me decided to go left….It was not a pretty sight…A full on crash…I was so embarrassed. What a rookie error. How could I mix up a right with a left….Oh well. As I said it was just not my day…Maybe it was a sign that I just need a bit of a surf break. I was surfing heaps lately. My break did not last that long though. Saturday morning it was a bit smaller and there was this really fun little right in front of the skateboard park in Bondi. Forgotten was the day before and I was back in the water. The water was a beautiful 23 degrees. I’ve spent a couple of hours having a ball. 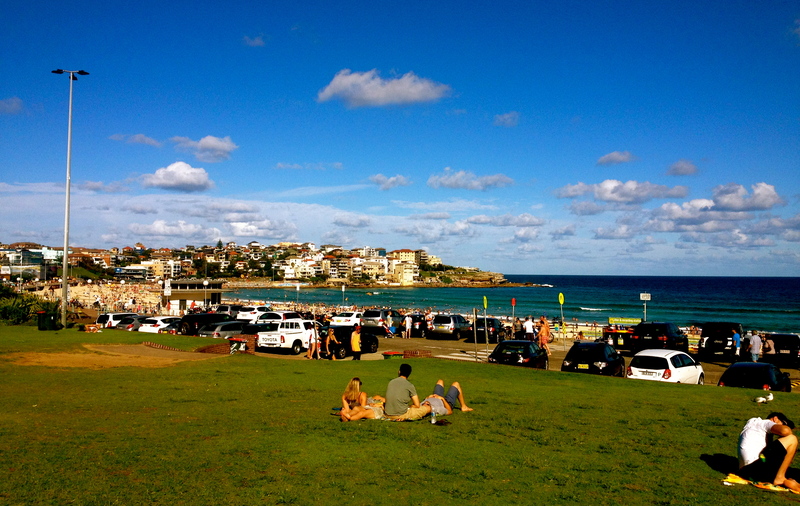 Considering it was a weekend in Bondi, it was not even that crowded. Well, that’s what I thought anyway. My friend who came to visit from down the coast and is spoilt with emptyish line-ups could not believe the crowds in 2ft surf. Nevertheless, he was still keen to come out for another surf in the afternoon. He’s a pretty amazing surfer and has spent most of his life surfing the best waves in world. I found it pretty inspiring that he still gets stoked enough to go for a surf in 2ft ave Bondi. Good on him. I’ll remember that next time, I whinge about Bondi. On Sunday, my little fun bank was still working. The water was still 23 degrees. Pretty much more of the same conditions like the day before. Nothing to get too excited about but still well worth to get out into the water on this beautiful Sunday for a fun little surf. Surf or no surf, hope you all enjoyed the lovely summer weekend. A little East swell is forecast for the upcoming week. Longboard for Bondi or Tama, Bronte or Bra for a bit more size.